Velezita: The Things They Asked For And Got! Wow, that shower is impressive!! I LOVE that deck too! 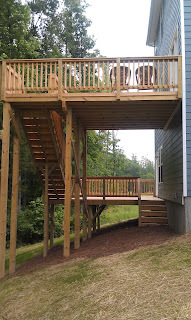 We'd love to do something similar since our deck will be high off of the ground too, but that'll be a little further down the road for us. That is awesome spa shower!! They did GOOD!! We have some custom requests but no pictures! The biggest request was adding a front porch to our elevation. It took six weeks to get approval. We have some non-standards too, but I'll have to remember to link you to them after they're built! Now that was smart! Did you have them do a pocket door so it didn't take up space in the small rooms? I would love to see pictures!